The "Loyola Four" took a moment to pray with the Rev. Larry Dowling on Monday morning during a rally that preceded a conduct hearing with university administrators. ROGERS PARK — A Loyola University student government club has been found responsible of "disruption" and will receive "educational and developmental" sanctions, a spokeswoman for the school said Wednesday evening. But the sanctions against the student government of Loyola Chicago do not include probation "of any kind," said Kristin Trehearne Lane, a spokeswoman for Loyola, who added the punishment would "help strengthen their internal processes and procedures." Details of the hearing and the reasoning for the outcomes, including specifically what punishment the student government will face, are not made public to "ensure student privacy," Lane said. The students charged with disruption now have three days to submit a formal appeal that would be reviewed and considered by the dean of students. The four individual students who were also accused, specifically for harassment, bullying and disruption, and had become known as the Loyola Four, were found not guilty of any of the allegations made against them, Lane said. 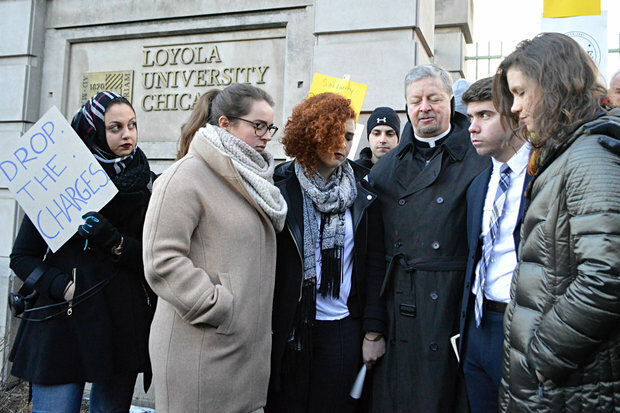 "I know people who have been bullied and harassed in their lives and this was not that," Sofia Sturla, one of the Loyola Four, said Monday during a rally alongside Catholic leaders and university students and staff. The students attended a conduct hearing with administrators Monday to determine if a Nov. 20 protest, which included a confrontation with an Aramark manager, violated the school's bullying, harassment and disruption policies. "We want to reiterate that we are not opposed to student demonstrations," Lane wrote in a statement to DNAinfo Chicago. "As a Jesuit, Catholic university, we strongly believe in, and welcome, debate and differing views on campus." Michael Fasullo, one of the four people found not guilty (and formerly the student government president who resigned after the accusations), told DNAinfo earlier this week his group presented 17 witnesses and 40 pages of evidence to disprove the university's allegations during a four-hour hearing. At the time, Fasullo said if the university found them responsible for the charges, the students planned to appeal. On Wednesday night, he said he and other students involved were working to formulate a response to the outcomes, but did not immediately have that statement available. Lane emphasized the decision was not based on the students' rights to demonstrate. "We support students who express their views through respectful and responsible means," Lane said. "In fact, it is a hallmark of the intellectual vitality and social awareness of our student body."